Our family enjoys playing board games. It’s not often that we find games that the younger two children can play with us (that we enjoy). 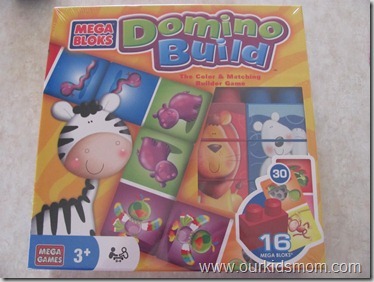 We were sent Mega Bloks Domino Build to try with Emma and Ethan. 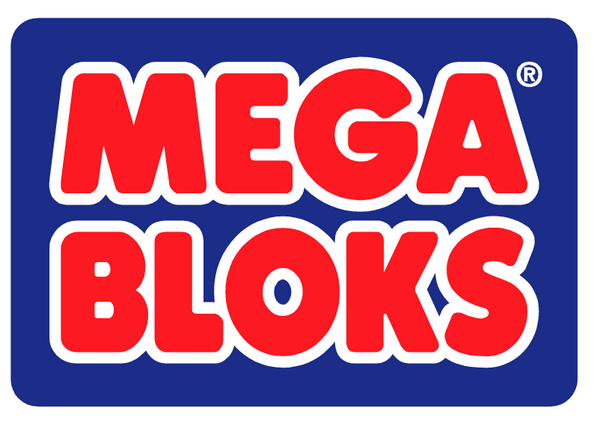 Mega Bloks has combined dominos and building blocks in one fun game. 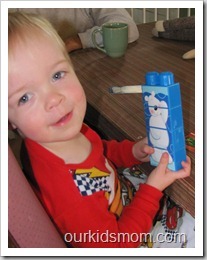 They have combined elements kids love to make it fun – animals, colors and blocks. Ethan is 2 1/2 and this game was a little on the hard side for him. I had to pretty much guide him at every step to play. 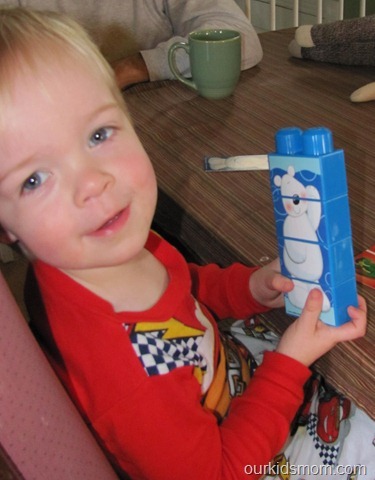 He could match the animals but didn’t grasp the concept of the dominos…so I am agreeing on the ages 3-6. 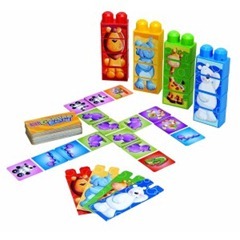 You match the animals on the cards in a domino style game. When you get a match, you get one of your building blocks. Stack them correctly to build your animal and you’ve won! Emma (age 4) had more fun with the game and understood the concept a little more than Ethan. Both of them enjoyed building their block animal and spending time playing with Mommy (and taking Mommy’s blocks to add to their own). The concept works well. 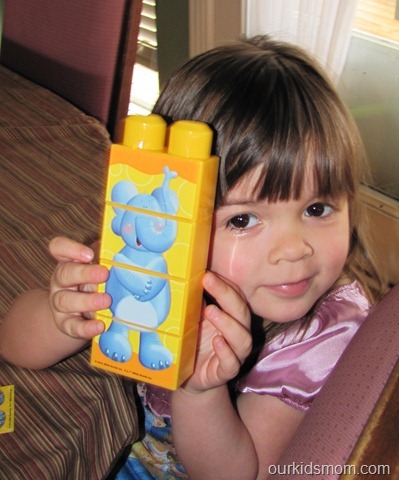 Children perceive shapes and colors through observation, touch and taking objects into their hands. 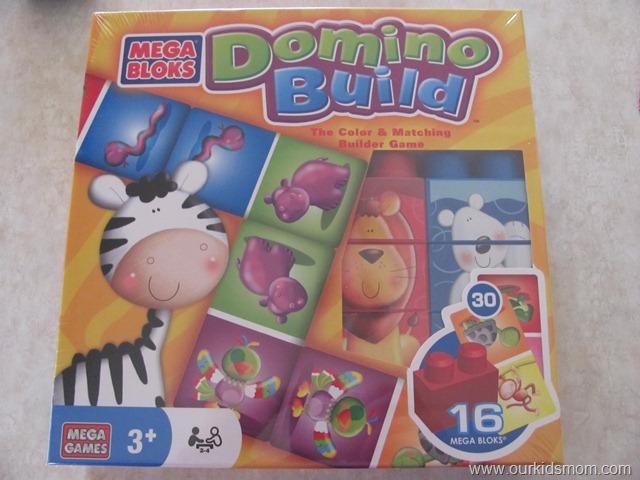 Domino Build offers a variety of solid colors and basic shapes imperative to teaching kids the distinctions among shapes and colors. 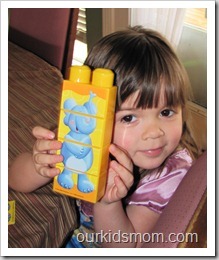 This game also helps children with their fine motor skills. Practice makes perfect… this game requires patience, practice and sometimes determination. The tangible nature of playing and manipulating the game pieces gives kids the opportunity to develop muscle movement and hand-to-eye coordination. This giveaway ended at 11:59PM EST on April 13, 2011. This post was written me and was not edited by anyone. The opinions expressed in this post are entirely my own and have not been influenced in any way. I received product for review purposes only. I was not compensated for this post. The sponsor is responsible for prize fulfillment and will be shipping the winner(s) their prize(s). For more information please read my disclosure policy. Too cool! 🙂 I would love to win! I like the ultimate action dragon destroyer. The Color Unblanks look like fun for the kids. I lIke you on Facebook as Anne Loyd. I like MegaBrands on FB as Anne Loyd. I entered the three DVDs giveaway. Entered Gear for the First Year! Entered the 3 DVDs giveaway! I like the Tombliboos adventure from the In The night Garden series. I learned that Mega Brand sells Hello Kitty toys. I entered Angelina Ballerina giveaway. I entered Hoodwinked Too giveaway. I entered Black Swan giveaway. My son would love these animals! I want the Disney Borders puzzle. Like your blog on FB. Entered Preschool DVD set giveaway. Entered Strawberry Shortcake DVD giveaway. Entered Angelina Ballerina DVD giveaway. I entered Pillow Pets giveaway. I follow GFC and we’d like the Play N Go Steamboat. I subscribe via rss feed on google reader. Entered your national geographic easter basket giveaway. I want the 550 piece Micro Bloks. Follow on GFC. “Like” Mega Brands on Facebook. Follow @ourkidsmomand @megabrands on Twitter and tweeted @MRSMEIER5627. Put you button on my blog. GFC follower as lewalk and love the Disney 3D Esphera Puzzles. Super cool. Entered Angelina Ballerina underpants giveaway. Entered Little Animal Pop Book giveaway. Entered Chronicles of Narnia giveaway. Did mandatory a few hours ago. Had to get some sleep. Lol. Like Mega Brands on FB as well. Follow both on Twitter and tweeted. Entered 3 DVD Set with Thomas, etc. Entered Angelina Underpants and Ears. I follow you via GFC. I like the Kid Zone. GFC. My kids would love: Disney Fairies Glitter. I never knew they made puzzles! I entered XBox 360 giveaway. I didn’t realize what cute toys they have! I liek the Safari Park set. I subscribe to your feed in my Google Reader. I entered the Microsoft Kinect giveaway. I entered the Chronicles of Narnia giveaway. I entered the Barney Playdate giveaway. I entered the Gulliver’s Travels giveaway. I entered the Strawberry Shortcake giveaway. Following you via GFC (mrsking14). I like thier CAT toys! I learned that they have characters that correspond with the mega bloks – thomas, smurfs, hello kitty… who knew?! I love the Blok Town Airport! So cute!! i learned mega is more than just a blocks company! they have a lot of different brands that we’d love to check out. I like the Hello Kitty line of products! I like Thomas & Friends. I follow your blog via GFC and I like the Probuilder Assault Chopper. Thanks. 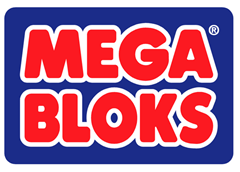 I want the Mega Bloks Classic Bag 80pc – could always use more blocks! All Aboard at Knapford Station.